Early studies of the pharmacodynamics of volatile anesthetics were limited by the lack of methods for objective control of the anesthesia depth. Clinically, accepted techniques mainly evaluated hemodynamic and motor reactions in response to surgical stimulation. This situation has changed after the introduction of the anesthesia depth monitoring based on the neurophysiologic monitoring such as electroencephalogram (EEG) spectral analysis and audio-sensory evoked potentials. Efficacy of the volatile anesthetic agents measured as minimal alveolar concentration (MAC) has been shown to change with a rise in the age of the patients  and with simultaneous administration of opioid analgesics. However, most of the studies concerning pharmacodynamics of volatile anesthetics have been performed in patients with a normal CO. The aim of this study was to investigate the influence of reduced CO on required sevoflurane to maintain a targeted anesthesia depth during cardiac surgery. After approval of the study protocol by the Ethics Committee and obtaining informed consent of patients, 36 patients scheduled for coronary artery bypass grafting with cardiopulmonary bypass (CPB) were prospectively enrolled in the study. All patients were monitored according to American Society of Anesthesiologists standards. In addition, thermodilution pulmonary artery catheter (Corodyn TD thermodilution balloon catheter, B. Braun Melsungen AG. Germany) was placed in all cases. Anesthesia was induced with intravenous propofol 1.5 mg/kg and fentanyl 5 μg/kg. Pipecuronium bromide (0.15 mg/kg) was used to facilitate endotracheal intubation. Analgesia was provided by 5 μg/kg/h fentanyl infusion or 200 μg fentanyl boluses administered before anticipated surgical stimulation such as 5 min prior to skin incision, 5 min before sternotomy and during the internal mammary artery harvesting. Anesthesia was maintained with sevoflurane, its concentration was adjusted according to spectral EEG analysis data (entropy index) to ensure the targeted anesthesia depth to state entropy index < 40. During CPB anesthesia was maintained with infusions of propofol 6 mg/kg/h and fentanyl 8 μg/kg/h. After separation from CPB, anesthesia was maintained with sevoflurane and fentanyl as described earlier. To assess the correlation of the CO on anesthetic efficacy of sevoflurane, we simultaneously measured hemodynamic parameters, end tidal anesthetic concentration and entropy index. These were measured before CPB at three time points: 1-5 min after sternotomy, during the internal mammary artery harvesting and during pericardiotomy. Anesthetic concentration in the gas mixture and state entropy index were measured with Datex-Ohmeda ADU S/5 (GE health-care) monitoring system. Cardiac index was measured by thermodilution method. Statistical analysis was performed using the Statistica (Stat Soft Inc.) version 7.0 software. Correlation analysis, scatter plot and regression estimation were used to detect the interactions between variables. Univariate analysis of variance was performed to compare the characteristics of two groups. Significance was set at P < 0.05. Patients age ranged from 50 to 65 years (mean age 58.5 ± 4.6 year). Thirty patients were males. Fentanyl was administered by intravenous bolus in 24 patients and by infusion in 12 patients, however there was no significant difference in the total dose of fentanyl administered until initiation of CPB (12.8 ± 0.9 μg/kg vs. 12.1 ± 1.2 μg/kg; P > 0.05). Sevoflurane concentration administered to achieve the entropy index < 40 ranged from 0.75 to 2.5 vol%. One hundred and eight sets of variables (entropy index, end tidal sevoflurane [ETsev], cardiac index [CI]) were recorded from 36 subjects at three time points; 13 sets were excluded due to errors in measurements. 95 sets of variables were available for further analysis. Mean CI was 2.8 ± 0.88 l/min/m 2 . In 20 sets of variables, CI did not exceed 2 l/min/m 2 , these measurements were obtained in seven patients with reduced baseline left ventricular ejection fraction. Mean entropy index was 38.1 ± 12.3. Targeted level of anesthesia (entropy index < 40) was achieved in 65 sets of variables (68.4%). Mean value of ETsev was 1.27 ± 0.35%. 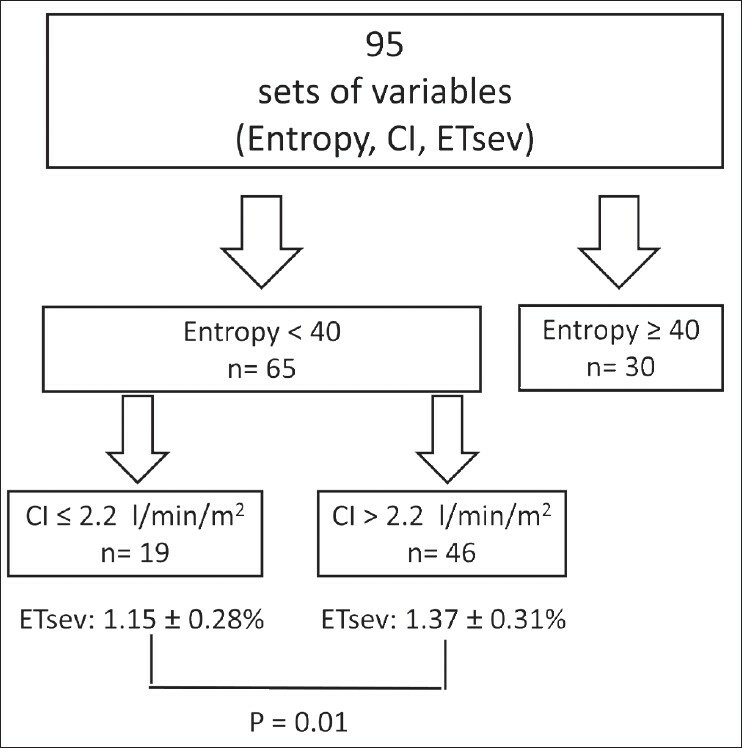 In the 65 data sets obtained in patients with entropy index < 40, the mean value of ETsev was 1.31 ± 0.31%. These data sets of variables were further analyzed to find the relationship between CI and ETsev. 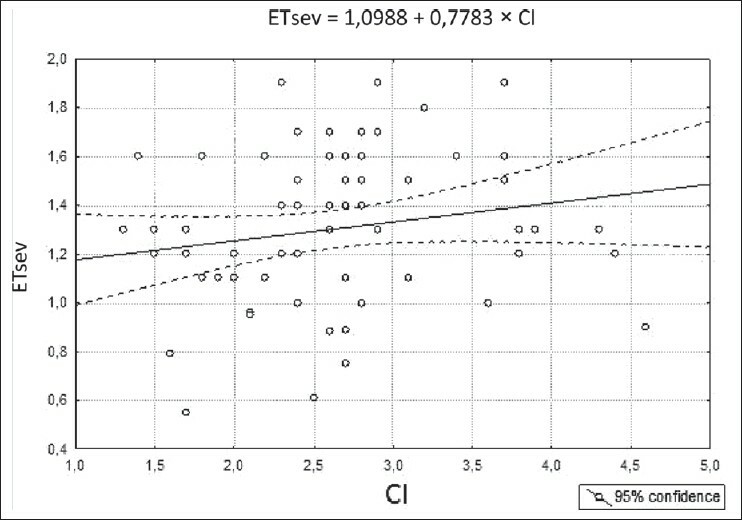 There was no linear correlation between CI and ETsev, correlation coefficient was 0.18, P = 0.14 [Figure 1]. The analysis of the scatter plot showed the existence of a non-linear correlation between CI and ETsev suggesting potential rise in the anesthetic efficacy of sevoflurane in patients with the reduced CI. The cutoff value for CI was found by using computer search method and was equal to 2.2 l/min/m 2 [Figure 2]. The ETsev necessary to maintain the target level of anesthesia was 1.15% ± 0.28% in patients with CI ≤ 2.2 l/min/m 2 versus 1.37% ±0.31% in patients with CI > 2.2 l/min/m 2 , P = 0.01. There was no significant difference in recorded factors known to affect the pharmacodynamics of sevoflurane requirements in cases with CI ≤ 2.2 l/min/m 2 or both groups [Table 1]. We observed relatively low values of ETsev in patients with the target level of anesthesia (entropy index < 40):1.31% ± 0.31%. Concomitant administration of the opioids is known to affect the pharmacodynamics of the volatile anesthetics markedly ,,, and presumably the main reason for the ETsev reduction. We used the infusion of fentanyl at 5 μg/kg/h or boluses of fentanyl 200 μg given preemptively. There was no significant difference in the total dose of fentanyl (induction to CPB start) administered as an infusion or as boluses (12.8 ± 0.9 μg/kg vs. 12.1 ± 1.2 μg/kg; P > 0.05). Considering age of the patients and patterns of fentanyl administration, the above mentioned doses of fentanyl is likely to provide plasma concentrations ranging from 2.5 to 3.5 ng/ml. ,, Katoh et al. studied the influence of fentanyl on sevoflurane pharmacodynamics and reported that afore mentioned fentanyl concentrations led to 50% reduction in the minimum alveolar concentration (MAC) of the volatile anesthetic, which corresponds to ETsev around 1.0%. ETsev reduction cannot be explained solely by the concomitant administration of fentanyl as its doses were similar in all patients, cases with CI ≤ 2.2 l/min/m 2 and cases with CI > 2.2 l/min/m 2 [Table 1] which suggests a decrease in MAC in patients with low CO (CI ≤ 2.2 l/min/m 2 ). Age is another factor that affects the pharmacodynamics of volatile anesthetics. However, the ages in patients with CI ≤ 2.2 l/min/m 2 or in patients with CI > 2.2 l/min/m 2 were statistically not different [Table 1]. Besides, ETsev reduction in these patients could not be a result of the influence of CO on the sevoflurane pharmacokinetics. Since, a sudden reduction in the CO leads to an increase in the ET concentration. Moreover,, measurements at the first time point were made at 41.5 ± 8.1 min after induction of anesthesia when the anesthetic concentrations in the inspired and alveolar gas mixtures had reached equilibrium. The reduction in ETsev necessary to maintain the target level of anesthesia in patients with low CO may be of pharmacodynamic origin. Our results allow us to make the following practical remarks. First, in patients with low CO the concentration of the volatile anesthetic should be reduced not only during induction but also during the maintenance of anesthesia. Second, in patients pre-disposed to a decrease in CO, including the elderly, anesthetic agent monitoring (F I and F ET ) does not provide precise estimation of anesthesia depth and EEG spectral monitoring (such as bispectral index or entropy) is recommended. The relationship between the CO and sevoflurane concentration required for maintenance of the target level of anesthesia is non-linear. Patients with CI ≤ 2.2 l/min/m 2 require lower ETsev concentration to maintain anesthesia with an entropy index < 40 than patients with CI more than 2.2 l/min/m 2 . In view of the small number of patients included in the study, the relationship between the ETsev, CO and anesthesia depth cannot be considered firmly established and further investigations with a greater number of participants are required. 1. Lockwood GG, White DC. Effect of ventilation and cardiac output on the uptake of anaesthetic agents from different breathing systems: A theoretical study. Br J Anaesth 1991;66:519-26. 2. Kennedy RR, Baker AB. The effect of cardiac output changes on end-expired volatile anaesthetic concentrations - A theoretical study. Anaesthesia 2001;56:1034-40. 3. Myles PS, Storer R, Millar C. Haemodynamic effects and uptake of enflurane in patients undergoing cardiac surgery: Good versus poor myocardial function. Anaesth Intensive Care 1992;20:21-7. 4. Watt SJ, Cook LB, Ohri S, Lockwood GG. The relationship between anaesthetic uptake and cardiac output. Anaesthesia 1996;51:24-8. 5. Hendrickx JF, Van Zundert AA, De Wolf AM. Sevoflurane pharmacokinetics: Effect of cardiac output. Br J Anaesth 1998;81:495-501. 6. Kennedy RR, Baker AB. The effect of cardiac output changes on end-tidal volatile anaesthetic concentrations. Anaesth Intensive Care 2001;29:535-8. 7. Matsuura T, Oda Y, Tanaka K, Mori T, Nishikawa K, Asada A. Advance of age decreases the minimum alveolar concentrations of isoflurane and sevoflurane for maintaining bispectral index below 50. Br J Anaesth 2009;102:331-5. 8. Castanelli DJ, Splinter WM, Clavel NA. Remifentanil decreases sevoflurane requirements in children. Can J Anaesth 2005;52:1064-70. 9. McEwan AI, Smith C, Dyar O, Goodman D, Smith LR, Glass PS. Isoflurane minimum alveolar concentration reduction by fentanyl. Anesthesiology 1993;78:864-9. 10. Brunner MD, Braithwaite P, Jhaveri R, McEwan AI, Goodman DK, Smith LR, et al. MAC reduction of isoflurane by sufentanil. Br J Anaesth 1994;72:42-6. 11. Katoh T, Kobayashi S, Suzuki A, Iwamoto T, Bito H, Ikeda K. The effect of fentanyl on sevoflurane requirements for somatic and sympathetic responses to surgical incision. Anesthesiology 1999;90:398-405. 12. Shafer SL, Varvel JR, Aziz N, Scott JC. Pharmacokinetics of fentanyl administered by computer-controlled infusion pump. Anesthesiology 1990;73:1091-102. 13. Thomson IR, Henderson BT, Singh K, Hudson RJ. Concentration-response relationships for fentanyl and sufentanil in patients undergoing coronary artery bypass grafting. Anesthesiology 1998;89:852-61. 14. Hudson RJ, Thomson IR, Henderson BT, Singh K, Harding G, Peterson DJ. Validation of fentanyl pharmacokinetics in patients undergoing coronary artery bypass grafting. Can J Anaesth 2002;49:388-92. Authors of Document Canty, D.